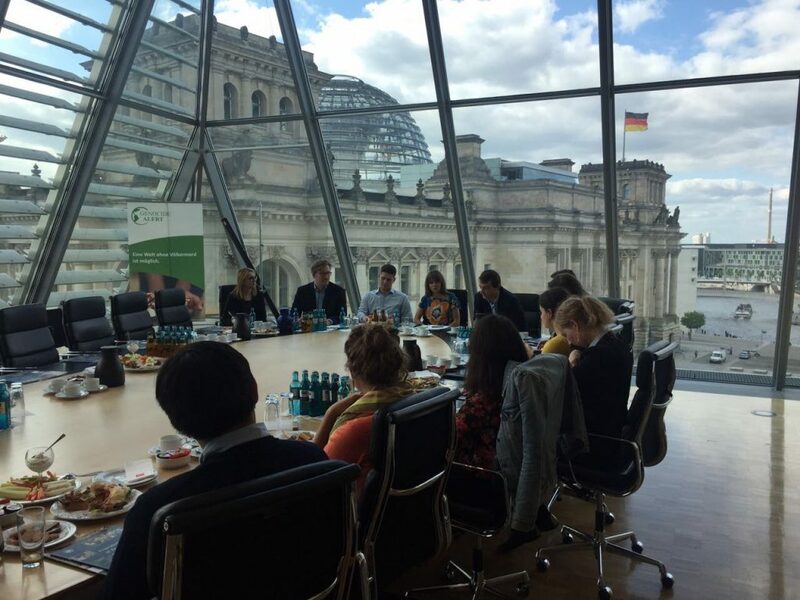 On July 13, 2017, the Auschwitz Institute for Peace and Reconciliation (AIPR) joined with German human rights organization Genocide Alert and the Parliamentarian Staff Members Association on Foreign Policy (AVSP) to organize a roundtable discussion on atrocity prevention at the German parliament. The event was held just weeks after the German government declared the prevention of genocide and other grave human right violations to be a national priority in its new guidelines on crisis prevention, which were adopted on June 14, 2017. An overview of these new guidelines, entitled “Preventing crises, managing conflicts, building peace,” can be found here on the website of the German Federal Foreign Office. 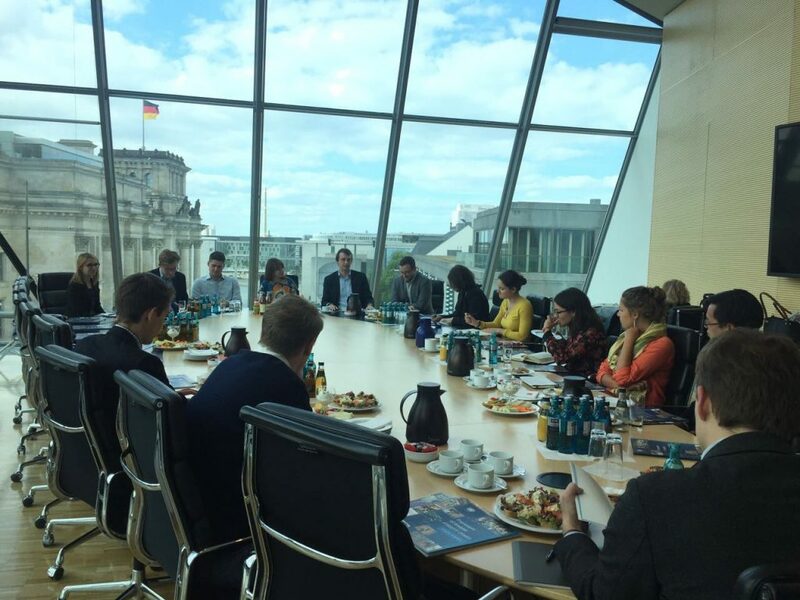 During the event, the roundtable’s 16 participants discussed how, and to what extent, approaches on atrocity prevention taken in the United Kingdom and the United States could be transferred to Germany. Dr. Kate Ferguson, Director of Research and Policy at Protection Approaches, made a presentation to the group that included examples of successful parliamentarian engagement in the United Kingdom. In light of the fact that the German government is looking to restructure its approach to civil crisis prevention and conflict management, challenges discussed by attendees included discursive considerations related to the Responsibility to Protect (R2P) and, more generally, the ongoing lack of attention for prevention. Attendees expressed concern that, since the 2011 intervention of international forces in Libya, the public image and discourse surrounding the principle of the Responsibility to Protect has been primarily reduced to its military component, despite the efforts of non-governmental organizations and the United Nations to highlight the importance of the preventive agenda at its core. In addition, participants highlighted how the German government has declared mass atrocity prevention to be a national interest and has committed to strengthening interministerial coordination on preventive efforts, and discussed possibilities for incorporating a government wide mass atrocity-specific lens into this work. Roundtable participants, including Dr. Ferguson, noted that the addition of a mass atrocity prevention lens to the work of existing bodies on crisis prevention is often vital to the early identification of risk situations and the implementation of timely responses. At the meeting, copies of the 2017 edition of the Auschwitz Institute’s Booklet on National Mechanisms for the Prevention of Genocide and other Atrocity Crimes was distributed to participants, who considered and discussed the resource. As with the previous annual updates, this edition of the publication provides updates on existing and emerging Mechanisms and a collection of important lessons learned for use by States that are considering the formation of their own National Mechanism. The 2017 version of the Booklet also focuses specifically on covering the major challenges related to the formal institutionalization of National Mechanisms into the structures of national-level governance in which they operate. This edition of the publication, along with past annual updates, can be found here on our Publications page.